Telescopes are exhibited during the Astrum 2009, Astronomy and Instruments exhibition at the Vatican museum. The Vatican is commemorating physicist and philosopher Galileo Galilei, who was prosecuted by the Inquisition in the 17th century, in an exhibition which opened on Thursday. The Vatican scrapped plans in January to put up a statue of the inventor of the telescope, who was also convicted of "grave suspicion of heresy" in 1633. 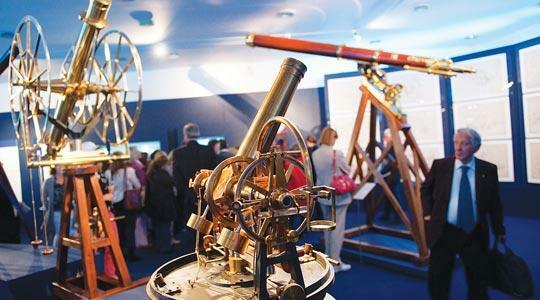 The president of Italy's National Institute of Astrophysics, Tommaso Maccacaro, said the exhibition "presents a selection of instruments that show astronomy's trajectory and progress. Particular attention falls on Galileo's telescope." Photographs from Italian astronomy expeditions, notably to India in 1874, are also on display in the exhibition to mark International Astronomy Year. Galileo's original 1609 telescope, which marked the birth of astronomy, is held in Florence. A reproduction will be used in the Vatican museums. Galileo avoided being burnt at the stake by agreeing to recant his view that the sun rather than the earth was at the centre of the universe, but the Vatican banned his books. Not until 1992 did the Roman Catholic Church formally admit its "error" in condemning Galileo's assertions.